Walkers have four legs. All four should be in contact with the ground when walking. 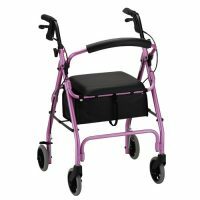 This allows for stability and partial weight bearing while walking. The walker is lifted and moved forward and then set down again with each step. Walkers do not have wheels. 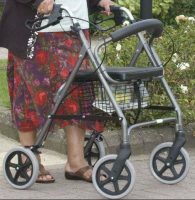 A rollator has four wheels and brakes. It doesn’t require the user to lift it up and move it forward, so it works better if the user lacks arm strength. Four-wheeled rollators can be used when only minimal walking support is required. Rollators are faster and easier to maneuver because of the swivel wheels. 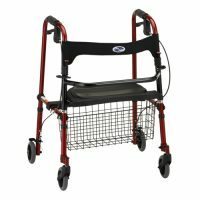 Rollators also can be outfitted with accessories such as padded seats, shopping baskets, and a variety of hooks and clips for carrying canes and umbrellas. 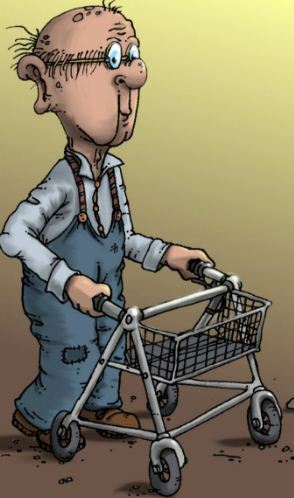 Using a walker /rollator safely. How do I use my wheeled walker (Rollator) safely? A rollator has four wheels and brakes. It doesn’t require the user to lift it up and move it forward, so it works better if the user lacks arm strength. 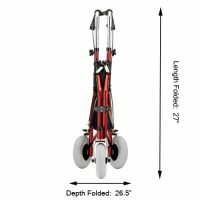 Four-wheeled rollators can be used when only minimal walking support is required. Rollators are faster and easier to maneuver because of the swivel wheels. 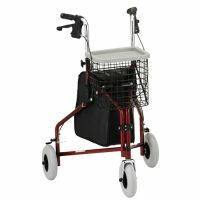 Rollators also can be outfitted with accessories such as padded seats, shopping baskets, and a variety of hooks and clips for carrying canes and umbrellas. Three-wheeled rollators have only one front wheel making them much easier to maneuver in tight spaces; like an apartment.